The Ultimate Gotham City Showdown! 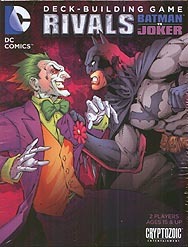 The Dark Knight squares off against the Clown Prince of Crime in the first DC Comics Deck-building experience designed from the ground up as a 2-player match-up. Play as Batman or The Joker! Introducing "Confrontation" rules where assaults are launched at the opposing character. New "Block" cards to defend against direct character attacks. Dozens of new takes on Equipment, Super Power, Location, Hero, and Villain cards. Contents: 98 Game Cards, 6 Oversized Super Hero Cards, Rules.